That glitter in the bike lane on Queen Avenue Saturday was splinters of glass. Riding the bike along some of Albany’s thoroughfares Saturday, what I wondered about was this: Where is all that splintered glass coming from? Along segments of Queen Avenue, Waverly Drive, 34th Avenue and Geary Street, broken glass was a common sight. I was grateful that none of it caused me a flat. But I wondered why there was so much of it and where it all was from. Surely there could not have been that many automobile collisions in the straight stretches of those streets since the last time the streets were swept. I thought that maybe what I was seeing was the result of glass bottles being tossed from cars. Maybe some of it was, but most of it did not really look like bottle glass. Not thick enough. When you google “glass in bike lanes,” you come across a couple of entries from Folsom, Calif., where people had used an app called “SeeClickFix” to call the city’s attention to that very thing. You also find an entry from Portland, where someone had used an Oregonian/OregonLive feature to report a glass outbreak that caused at least three bike commuters to sustain flats at the same time. 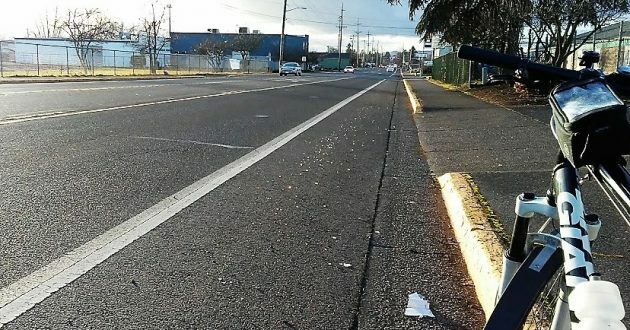 Bike lanes are very useful to everybody in traffic, preserving life and limb of cyclists and saving drivers from the costly ramifications of accidentally running somebody down. But when the danger of flats is significantly enhanced by sharp debris, the lanes’ utility obviously declines. Lemme take a crack at it. Could it be coming from Republic Services recycling trucks? I recall some years back when a group of Albany service clubs decided to assist with a citywide cleanup effort. We did the overpass and major streets and sidewalks. It was coordinated with the city, and we must hsve had a hundred volunteers. I recall bringing my own broom and rake. Maybe it’s time for another such effort. It maybe time! No doubt there will be much clean up required after 45. I know Trump is 45. He likes to call himself that….45th president, that is. But, please say Trump when you mean Trump, so that everyone will know. We need to remind people of his destruction of our country’s foundation as much as we can. Yes, there will be a lot of clean-up required after him, if there is anything left to clean up. I was there with Bob when Kiwanis cleaned the viaduct. ODOT IS responsible for Highway 20, including the viaduct, 9th street and Santiam was well as Lyon and Ellsworth. That includes painting crosswalks on those streets. We asked ODOT to help and I believe got some small help cleaning the viaduct. Just for reference Mary, Trump has nothing to do with cleaning our streets. Bill Higby…I know Trump has nothing to do with cleaning the Albany streets. Did you even read (maybe like Trump, you don’t read much) the letter I commented on from hj.anony1 which said, “….there will be much cleanup required after 45.”? 2. from people that actually went out and did something positive and 2 from a couple whiners that can’t even remember what the topic was. Bless your heart, Bill Kapaun; aren’t you clever?